As temperatures drop, and York braces for wintry driving conditions, it’s important to prepare yourself and your vehicle. Last year, we offered a complete guide to winter driving. But we recognize even the best preparations cannot always prevent a bad-weather accident from occurring. In 2015, PennDOT reported more than 25,000 accidents in bad weather (snow, ice, rain and fog) across Pennsylvania. If you find yourself in a bad-weather accident, here’s what you should know. While you can’t control the weather, insurance companies do believe that if you make the decision to get behind the wheel in those conditions, you are taking full responsibility for you, your passengers and your vehicle. Therefore, insurance will always determine someone at fault. Even if there are icy conditions, if you’re the driver sliding into someone else’s lane, you are responsible for causing the accident. It is possible that the fault could be deemed 50-50, acknowledging that both drivers are to blame. For example, in snowy conditions, you start sliding, when another car slides into you. In this example, both drivers will share the responsibility of being at fault. When at fault (even in a 50-50 scenario), you’re likely to see insurance premiums increase, as the accident will appear on your insurance record. 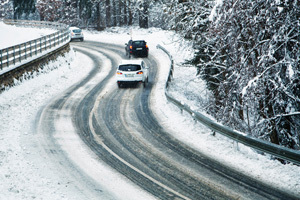 It’s important to note that while insurance companies will always deem at least one driver at fault, legal charges may be dropped due to bad weather conditions. Another words, you may not have to pay a fine and you may not receive points on your license if the accident was caused due to bad weather conditions. If you believe the other party is at fault in a bad-weather accident, you have the right to appeal the decision. However, wintry road conditions alone may not be your justification for why you are not at fault. You must prove the other party is responsible for the accident’s occurrence. We specialize in helping people who have been injured or have suffered the loss of a loved one due to an accident. Count on us to get the Results You Deserve®. Contact one of our personal injury attorneys 24/7.